Andrea Kvas is an Italian artist who achieves a personal revision of pictorial grammar through a constant analysis of its fundamental components: sign, color, form and surface. He was born in Trieste in 1986. Boy with Bucket is the suggestive title of Andrea Kvas’ first solo exhibition in Germany, hosted at Chert. There is no preferential way of viewing these pieces. Since there is no linear front, back or base, they can be moved, turned and placed in different positions. Untitled, abstract, informal and purely physical, Kvas’ work produces perplexing questions around the themes of perception, of vision, of experience. This tension can only be released by removing our pre-conceptions, to enjoy the works, their materiality and inner poetic nature. While moving freely between works on paper and works on canvas, wall drawings and installations of various sizes, his artistic practice includes elements of chance and improvisations which allows the member of the audience to find his own narrative route inside the work. Andrea’s work merges an instinctive and playful approach to painting with an analysis and reconsideration of the codes that distinguish this discipline. Radicalizing, deconstructing and reconstructing in particular the relationship between paint and supports, his pictorial research calls for different fruition schemes; an attitude that led Kvas to find intersections with sculptural and relational practices. Painting is not intended merely as an object of contemplation, but as an instrument to set active dialogues with other objects, environments and the public, aiming to emphasize the contingence of materiality. 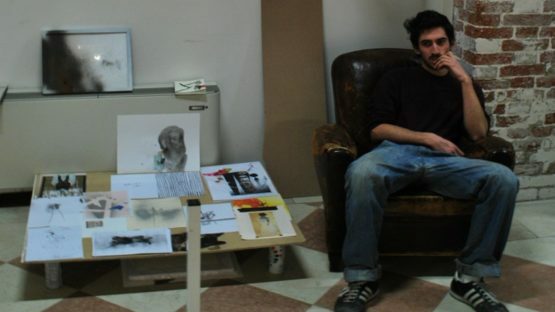 Andrea’s exhibition Atacai in Turin shows that his work is based on the deconstruction and analysis of the painting object. This analytical approach leads the developer to define the fields of action within which you can move, in both instinctive and emotional ways, experimenting with different techniques and approaches. Often starting from the recognition of unusual or marginal areas, even if they are invested with a structural function like corners or ceilings, Kvas interventions assume a shape of infections which contaminate the environment in which they develop. The impromptu distinguishes the practice of Kvas, whose works are organisms made up of tensions of matter, stratification; chromatic relationships, spatial evocative and expressive. It is on this physical plane, unmediated, that the viewer is invited to engage with the works in their individual and contextual specificity.